At more than half the tissue market in volume and marketed in boxes and plastic covers, Hayat Kimya sees a chance to advance a unique cultural choice. Turkey’s Hayat Kimya has been on a steady expansion path for many years. With tissue and paper facilities brought on stream in countries including Russia, Iran and Bosnia Herzegovina, as well as further plants in Turkey, the company is now preparing to launch a tissue site in Egypt. A 70,000tpy Valmet-supplied tissue PM has been ordered for the Egyptian factory, which will be located in Ain Sokhna by the Red Sea. Production is expected to start at the end of 2016. Lütfi Aydin, Hayat Kimya’s paper group director, explains why the company has chosen the Egyptian tissue market to expand further into. 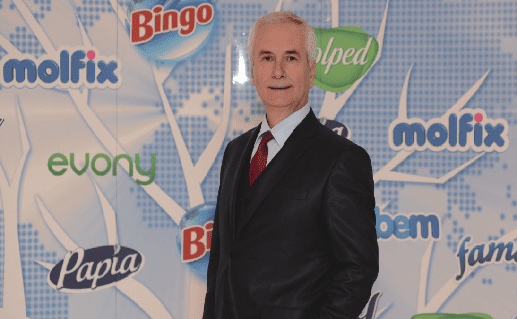 “Hayat Kimya has operated a hygiene plant in Egypt since 2012 and has accumulated a considerable amount of consumer understanding to expand its business in the tissue category. “The Egyptian tissue market is heavily dominated by local players, and we only saw investment by some of these players in tissue mills between 2005 and 2007. “According to Nielsen data, Egypt differentiates from other European markets with its facial tissue usage. Facial tissue makes up more than half of the tissue market in volume (55%), whereas it makes a relatively smaller portion in Europe. “What’s interesting about facial tissue in Egypt is that it is not only offered in boxes but in plastic covers. Moreover, toilet paper volume is rather small (20%) in the tissue market and the most common products are two-roll packs due to small stock area in the traditional market selling points, which makes 80% of trade. “In addition, Egyptians are price sensitive, and therefore they prefer to buy as per their need, as opposed to planned purchases from supermarkets. “Another interesting fact about the Egypt market is that compressed and large sized B2B toilet papers were initially planned/produced for B2B and Away-from-Home channels but have now become premium perceived end-consumer products. Share the post "Target: Egypt’s distinctive facial tissue preference"